Yesterday (31st March 2008), the Bangalore round of the Economic Times and Idea/ Brand Equity Quiz took place at the Chancery Hotel, Residency Road. 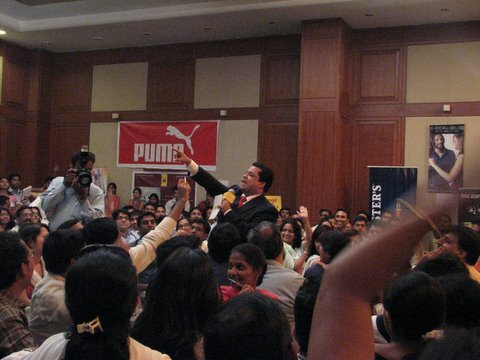 True to celebrity-convention, Derek O’Brien, the quizmaster, had Andrew Scolt to “open” the quiz for him with 30 questions that the 50 teams who had registered had to answered. Andrew seemed to relish moving about the hall and interacting with the enthusiastic crowd, but is yet to master the expertise, and also the easy banter that Derek has. He went around asking a lot of audience questions, and distributed some audience prizes too. Six teams made it to the finals: as Derek announced, in alphabetical order,they were: CISCO, Deutsche, Kotak, Nokia,Wipro, and Yahoo.